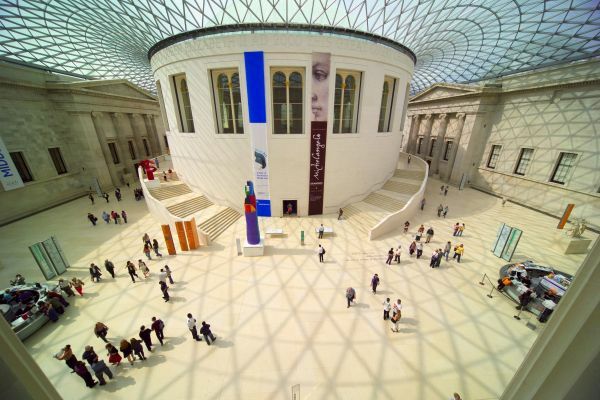 All the best destinations to visit in the UK have museums, galleries, and collections. Some are superb - the finest in the world, in fact. But others duplicate things you can see and stories you can learn elsewhere. My list of THE BIG 5 Museums highlights the best of the best. These are unique treasure houses where you will see objects and collections you cannot see anywhere else, displayed in exhibitions designed to help you enjoy and understand them. Including the best in your itinerary will add immeasurably to the wonderful memories and experiences you'll take home from your UK visit. But there is such a thing as overkill. Too many museums, too many hours in museums and the most amazing exhibitions can start blending together in an indistinguishable mishmash of stuff. Knowing how to approach the history, culture, art , and treasure in Britain's best museums makes all the difference. Before you dip into my personal choice of THE BIG 5 Museums in the UK, check out my pointers on how to get the best out of them. Know your limits - Britain's museums house collections gathered from every corner of their 19th-century empire as well as pretty much every area of contemporary academic interest and human endeavor. They are not attractions geared to be taken in all at once. You may think you can spend a whole day in the British Museum or the Kelvingrove or the Birmingham Museum and Art Gallery, but believe me, most people can't. And even if you could, you still could not see everything. Set yourself a time limit - a morning, a few hours. Take a break for coffee or lunch; the museum will still be there to explore when you're refreshed. If you're like most people, you probably won't want to. Don't beat yourself up about it. Plan ahead - All the museums in my list have very good websites with lots of detail about their collections, their facilities, their floor plans, their shops and cafes. Check it out and have a short list of the things you'd most like to see. You don't have to be rigid about it. Once you get to the museum, something else may appeal to you more than anything on your list. But at least you'll have a framework for your visit so that you're not overwhelmed by the choices or rushing from one end of the museum to the other without really seeing what you are looking at. Don't forget to check their website's What's On or calendar pages for special exhibitions scheduled during your visit. Book ahead - All the museums on this list are free but sometimes charge admission for special exhibitions. Even when special exhibitions are free they may be ticketed to control the flow of visitors. If you really want to see a particular blockbuster exhibition, buy your tickets for it online, in advance. If you wait until you get here you may be too late. Contrary to popular belief, the British Museum is not the world's oldest but with 8 million objects and artifacts, it can definitely lay claim to being one of the world's largest and most comprehensive. Its focus is human history and culture - as far back in history and prehistory as it can be found and from every possible corner of the planet. I have no doubt that if evidence of extraterrestrial civilization is ever discovered, it will wind up in the British Museum. It can be an exhausting place - so pick a topic and follow it. Highlights for me include the Rosetta Stone that unlocked the secrets of Egyptian hieroglyphics, the ancient Greek and Egyptian galleries and the fascinating mummies, along with their grave goods and accessories. The new African galleries, on a lower ground floor beneath the Great Court, are eye-opening as well. Indigenous Australia - April 23 to August 2, 2015. A look at one of the world's most enduring civilizations with objects reflecting 60,000 years of Aboriginal culture. Bonapart and the British - Prints and propaganda from the age of Napoleon, February 5 to August 16, free. Where: British Museum, Great Russell Street, London, WC1B 3DG. Nearest London Underground Stations - Holborn, Russell Square, Tottenham Court Road or Goodge Street. Admission: Free except for special exhibitions. Facilities: Cloakrooms (including large luggage checking), restrooms and baby changing facilities. Excellent shop and three restaurants. Access: A range of access features including lifts on either side of the staircase on Great Russell Street, wheelchairs and magnifying glasses to borrow, large print guides. The V&A, as the Victoria and Albert Museum in London's South Kensington is known, is the place to wander through 5,000 years of decorative arts and design. Furniture, ceramics, glass textiles, fashion, jewelry, printmaking, photographs (one of the largest and most comprehensive collections of photographs in the world) have been gathered from Europe, North America, Asia, the Pacific Rim and Africa. The museum's fabulous and historic collection of Islamic Art is probably the best in the Western world. Alexander McQueen: Savage Beauty - March 14 to August 2, 2015. This will be a sell-out so book early. Shoes: Pleasure and Pain - June 13 2015 to January 31 2016, from ancient Egypt to the present day. Bejewelled Treasures: The Al Thani Collection - November 21 2015 to March 28 2016, fabulous objects from a single collecton. Julia Margaret Cameron - November 28 2015 to 14 February 2016 - 100 photographs from the museum's collection of one of the 19th century's most important experimental photographers. London SW7 2RL. Nearest London Underground Stations - South Kensington, Gloucester Road or Knightsbridge. Facilities: Cloakrooms, restrooms, and baby changing facilities. Best museum shop in London. The restaurant is noisy but worth a visit as its tile and decor represent the first public commission of the William Morris Company. Special exhibitions planned for 2015 and beyond include Faith & Action: Quakers and the First World War, free exhibition on until June 7 2015. The International Slavery Museum in Liverpool is not very big - in fact it is just one floor in the city's Merseyside Maritime Museum. But it is the only museum and national collection devoted to the transatlantic slave trade and its legacy in the world. It more than makes up in impact what it lacks in size. Historically, Liverpool was one of the anchors of the triangular trade of sugar, molasses, rum, cotton and slaves. It also became one of the centers of the Abolitionist movement. But this is not just a museum about slavery in a historical context. It also explores slavery and human trafficking as we are becoming aware of it in the 21st century. The three main galleries cover Life in West Africa, Enslavement and the Middle Passage, The Legacy, including the continuing fight for freedom, racism and the achievements of the African Diaspora. A changing array of temporary exhibitions further enlightens visitors about important historical figures and contemporary issues. Facilities: Downloadable museum guide, cafe and restaurant shared with the Maritime Museum, free wi-fi, museum shop. Access: Lifts and wheelchair ramps to all floors, videos and interactive displays have subtitles with British sign language available on demand. Management of Glasgow's Kelvingrove Art Gallery and Museum boast that it is the most popular free-to-enter attraction in Scotland and the most visited UK museum outside of London. So they must be doing something right. Refurbished in the first decade of the 21st century, this gigantic storehouse of a museum has something fabulous for everyone. Known for its world-class arms and armor collection as well as its natural history exhibitions of dinosaurs and prehistoric mammals, it also houses Scottish history and archaeology collections, world culture galleries and very wide-ranging art collecton. Dutch Masters, French Impressionists, Scottish art by the Glasgow Boys and the Scottish Colourists are all represented. Salvadore Dali's Christ of St John of the Cross is a star painting and there's a gallery devoted to Scottish Modernist architect Charles Rennie Mackintosh and the Glasgow Style. The elaborate 19th-century building is worth a visit all by itself. Facilities: Cloakroom, baby changing and baby feeding, pram and buggy storage, shop, cafe and coffee shop. Access: Welcome video available in British and International Sign Language. Lifts and wheelchair accessibility, accessible toilets with adult changing facilities.